The great activism and social commitment of the Earth Market recognized by the international Slow Food network Today the Maitland Earth Market has been awarded by Slow Food with the Gigi Frassanito* recognition during the Earth Market Summit at the international event Terra Madre Salone del Gusto 2018 held in Turin, Italy. The Maitland Earth Market, organized by Slow Food Hunter Valley, became in 2017 the Australia’s first Slow Food Earth Market following a touching story of community help and local support. “We are deeply honored to receive this award on behalf of our farmers, producers, members of Slow Food Hunter Valley and our Earth Market community volunteers – says Amorelle Dempster, leader of Slow Food Hunter Valley. “The Earth Market in Maitland has been a catalyst for significant change in our local food system. This prize will be used to give young farmers a helping hand to introduce local varieties and biodiversity into their farms and help them bring it to the Earth Market”. In 2016 Slow Food Hunter Valley became aware that a local famer was going to have to plough 20 tons of pumpkins into the ground because they had become muddy after the 2016 floods. To help the farmer and address food waste, SF Hunter Valley approached the Maitland City Council about setting up a pop-up stall at The Levee in Central Maitland to sell the pumpkins to the local community. Support was overwhelming: The entire crop of 20 tons was rescued and over 2,000 pumpkins were sold in a day. 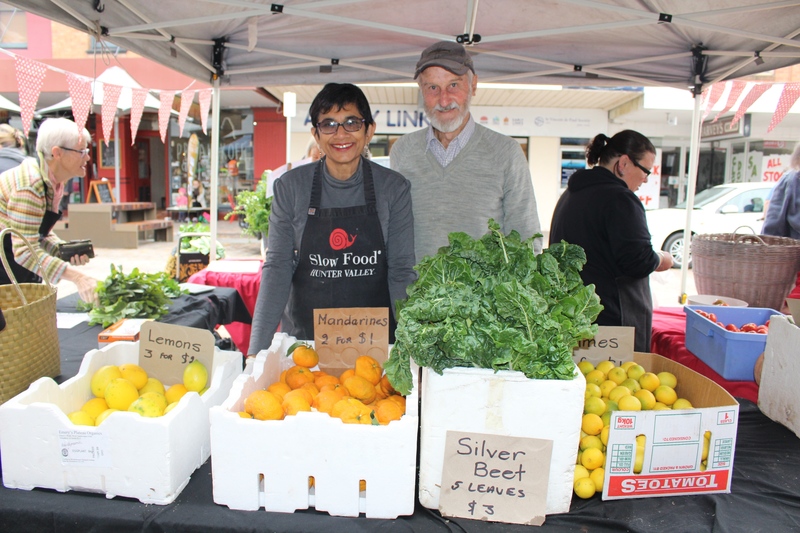 Based on the success of this collaboration, SF Hunter Valley, with support from the City Council, decided to set up the Maitland Fresh Farmers Market (MFFM), which, over the next seven months, sold 20 tons of local produce. Opportunities for young people to work on farms have increased, and farmers have begun to grow many local varieties and to diversify their operations in response to consumers’ demands. The Earth Market is held every first and third Thursday of the month at The Levee in Central Maitland and it currently involves 12 producers who live within 100 kilometers of Maitland. Slow Food Earth Markets are farmers’ markets established according to guidelines that follow the Slow Food philosophy. These community-run markets are important meeting points where local producers offer healthy, quality food directly to consumers at fair prices and guarantee environmentally sustainable methods. In addition, they preserve local food cultures and help defend biodiversity. Currently there are 66 Earth Markets in 20 countries (Australia, Austria, Bulgaria, Chile, Colombia, Estonia, India, Israel, Italy, Latvia, Lebanon, Mauritius, Mexico, Mozambique, Poland, Puerto Rico, Spain, Turkey, Uganda, and the United States). *The Slow Food Foundation for Biodiversity has established an award in memory of Gigi Frassanito, a young collaborator who died prematurely. The 2017 edition of the award went to the fundraising project “La buona strada – Ripartiamo dal cibo,” which helps Italian producers who were hit by the 2016 earthquake. The Markets in Foça (Turkey), Maputo (Mozambique), Coquimbo (Chile), and La Serena (Chile) won previous editions of the award.